At the ocean-front Bacara Resort, a temporary wall keeps the 1,500-square-foot beach house from falling into the waves. A lot has changed since the luxury resort was finished in 2000: The City of Goleta formed in 2002, and climate change became physically evident. But the memory of the bitter fight to stop the resort from being built has not been forgotten. 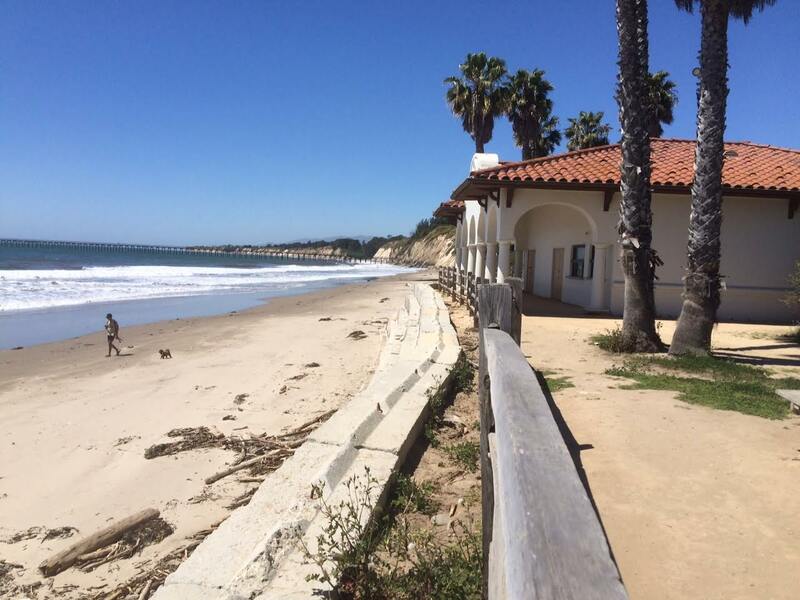 It was a repeated theme at Goleta’s Design Review Board meeting on Tuesday afternoon, at which Bacara presented plans to place a new “beach house” 180 feet to the northeast of the current one, beyond the 50-year wave run-up and sea-level-rise zones. Back in the late 1990s, the resort’s approval by the county was contingent on developers Alvin Dworman and Hyatt Hotels providing public access to Haskell’s Beach and amenities like bathrooms, showers, and a snack bar. And it was approved over serious opposition from Chumash tribal members, surfers, beachgoers, amateur historians, and rank-and-file residents. Some feared the development opened the door to building up and down the Gaviota Coast; others preferred to keep the jungle-like surf spot isolated and the archaeological remains unmolested. Boardmember Karis Clinton recalled that those who endorsed the project came to regret it. Now owned by the Ritz-Carlton chain, Bacara plans to put the new beach house along an emergency access road used by the fire department for water-rescue exercises and by the State Lands Commission for old oil structure removal from the beach. It would actually be two buildings: one a snack shop, the other to contain four separate toilet rooms. Their combined 607 square feet eliminate unneeded storage space and queuing areas. Boardmember Craig Shallanberger stated that Bacara’s original developer had gone for the maximum square footage for the beach house. The waves weren’t the only threat to the beach house, or Bacara’s plans, several public speakers said. The cliffs of the terrace to the east — beyond which lie the out-of-commission Venoco oil and gas plant — were crumbling, they said, and the cliff’s stability could be affected by the construction of the buildings. And the buildings themselves would be in an ecologically sensitive area that shouldn’t be built upon, some said, not to mention historic Chumash sites. None of the Design Review Board members were pleased with how they looked either, asking the project reps repeatedly if the barren drawings would deliver the resort’s rich design elements. Ginger Anderson, with Stantec engineers, and Greg Diegas of WATG architectural firm, explained Bacara’s plans had been through expert peer reviews for cultural, archaeological, and sea-rise issues. The location and dual buildings had been chosen to avoid sensitive habitat and still be close to the beach as required. A couple board members agreed with a speaker who thought the bathrooms should be at the parking lot. Board member and architect Dennis Whelan found it “inelegant” that bathrooms were a beachgoer’s first view from the path, though he acquiesced that’s exactly what some wanted to see. The board’s attempts to limit public comment to design issues stopped when Ernestine Ygnacio-De Soto addressed them. She greeted the board with “haku haku,” a Chumash greeting, which ended the “friendly” portion of her remarks. She then stated that the most relevant words she’d heard about the proposal so far were “self-serving,” uttered by Barbara Massey, a longtime champion of all things Goleta. Bacara lay on Chumash lands, she said, which once stretched from Malibu to San Luis Obispo. The best outcome, she thought, was a tsunami that would sweep them all away so that they would have to explain themselves to her ancestors.